SAN SALVADOR, Aug 21 2013 (IPS) - Josefina Escamilla was in the Salvadoran capital to protest against UK brewing giant SABMiller, whose local subsidiary plans to drill a new water well on land alongside her community that, she says, will cause water scarcity for local residents. “We are already old, but we are fighting for our children’s and grandchildren’s water,” Escamilla told IPS as, sign in hand, she helped block traffic on a busy street in the capital to protest the plan. 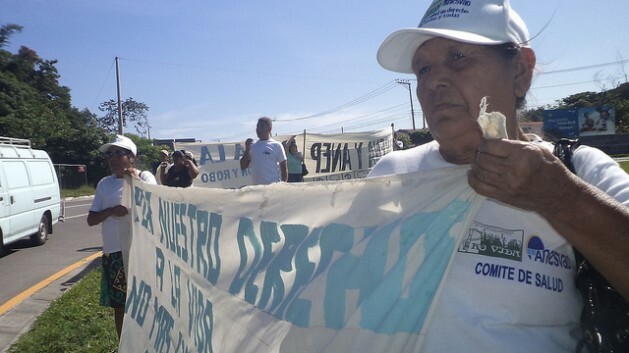 Communities in the municipality of Nejapa, 21 kilometres north of San Salvador, began to mobilise in April against the plan of Industrias La Constancia (ILC), a subsidiary of the London-based multinational SABMiller, to bore a new well at the company’s plant in the district of Galera Quemada in the same municipality. The communities, backed by environmental organisations, maintain that if the new well is drilled, the company will drain the local aquifer and leave local farmers and residents without water. Only 69.8 percent of rural households in El Salvador have piped water, compared to 93.5 percent in urban areas, according to the Multi-Purpose Household Survey of 2012. ILC dug two wells in Galera Quemada in 1999 and transferred its soft drinks bottling operations there, including the Coca-Cola brand. Now it needs a third well to increase its supply of purified water. The company began its operations producing beer in 1906, under the management of Rafael Meza Ayau, a prominent member of the local elite at the time. In 2005, when it had broadened its activities to include juices, bottled water, soft drinks and energy drinks, it was acquired by SABMiller, the world’s second largest brewer. SABMiller operates in 75 countries and in fiscal year 2012 it reported pre-tax profits of 6.4 billion dollars, according to its web page. As for ILC, it reported 30 percent revenue growth over the same period, without specifying the total. Carlos Flores, an activist with the Salvadoran Ecological Unit (UNES), an NGO, told IPS that local residents and environmental organisations presented 2,200 letters appealing against ILC’s project to the Ministry of the Environment and Natural Resources (MARN), expressing their concern that it would cause water shortages. Environment Minister Herman Rosa Chávez told IPS that his ministry was currently reviewing ILC’s environmental impact assessment, before carrying out its own analysis of the river basin in order to reach a decision. Hydrologist Julio Quiñónez told IPS that MARN’s 2005 report on Integrated and Dynamic Water Balance in El Salvador indicated that the Nejapa aquifer was already on the verge of being over-exploited. The same conclusion was reached by a 2003 report by World Geologists, an NGO working on management of natural resources and geological risks, which said that the water table has fallen since 1972 because water is being extracted faster than the aquifer can be recharged. Quiñónez said recharging the aquifer takes 15 million cubic metres of water a year, while consumption varies between seven and 10 million cubic metres, including commercial extraction by ILC and the water distributed to the population by the national water and sanitation company, ANDA. Reports from MARN indicate that digging the new well, in addition to the two that already exist, means 1.7 million cubic metres a year will be extracted. “People are right to express concern over the new well, it is not something to be taken lightly,” said Quiñónez. Another concern is that deforestation in the area, caused by urbanisation and an expansion of farming, will further reduce the recharging of the aquifer, while water demand is growing, he said. A document seen by IPS, sent from ANDA to the company on Jan. 10, 2013, said the new well would not affect water supply to the population if ILC’s extraction rate was below 1.1 million cubic metres a year – 600,000 cubic metres less than ILC plans to extract. The document – a “Carta de no Afectación” certifying that the rights of local people will not be affected – does not actually give the green light to the project but only states that if water extraction does not surpass that limit, ANDA can guarantee water supply to the local population. ANDA set further conditions for approval of the plan: ILC must carry out environmental compensation measures, build soakaways to direct rainwater to the aquifer, and install industrial water meters to measure the exact amount of water it consumes from the wells. The two existing wells, sunk in 1999, did not require a Carta de no Afectación, which has only been a requirement since 2004. ILC did not agree to IPS’s request for an interview about the conflict generated by the well project. Nor did ANDA grant an interview on whether ICL is still preventing ANDA inspectors from entering its San Salvador offices to read the well water extraction records, as has been reported. “They never let us in, there were heavies in the doorway to bar the entrance,” said Francisco Gómez, who was president of ANDA from June 2009 to January 2010. “The company paid for the water based on their own reports of what they used,” he told IPS. Meanwhile, Escamilla stood firm in the face of drivers’ complaints at the roadblock in San Salvador, maintaining her protest not only against SABMiller and ILC but also against right-wing legislators who are opposing a General Water Law that is being debated in parliament. The bill, which states that water is a public good and a human right, would increase control over and regulation of water, thus affecting companies like ILC. “With this law, we could more effectively defend water in Nejapa,” said Escamilla, who is from the Las Marias community in the area that would be affected by the wells.